Feeling trapped in a job you don't like? Discover how to transition into a new career with learnings from people who've done it.Working long hours, with no satisfaction? Want to start your own business, but not sure you can? Changing careers or setting up your own business isn't easy. Let experienced career coach Sarah O'Flaherty show you how others have made the transition.Sarah O'Flaherty has a successful business assisting people to improve their job/life satisfaction and to work through career-transition. After a successful twenty-year career in advertising, Sarah is now training to become a Clinical Psychologist. Using her own experience and interviews with others who have made major changes or established their own businesses, Sarah has created 9 landmark questions to get you through a career change in one piece. By answering these questions, you'll ensure a transition with minimal stress, while maintaining your relationships, your home, and your sanity.Inside Ready for a Career Change? you'll discover:How to break down the barriers we face when changing jobs so you can make the best decision for you.How others have changed careers and their key learnings so you can save time and benefit from their experience.The important questions to consider in a career change so you don't waste your time and energy on something that's not right for you.The benefits of a career change, such as increased energy and job satisfaction.And much, much more!Ready for a Career Change? 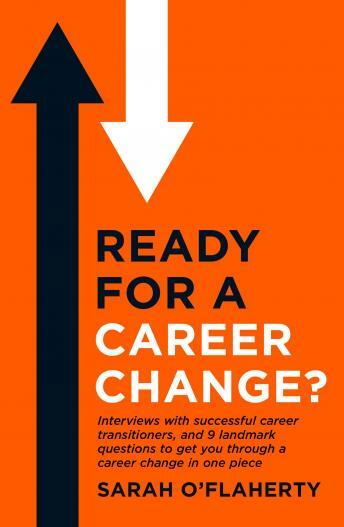 Is packed with straightforward, honest, and practical advice that can be your wake-up call to the life that awaits you in a new career. If you like easy reads that tell it to you straight, then you'll love having Sarah on your team.Buy Ready for a Career Change? to help you make the move to an exciting new life today!